I am enjoying Amanda DeWees books immensely. Nocturne for a Widow is the beginning of a new series based on the character of Sybil Ingram, an actress, whom we first meet briefly in With This Curse. Although the story is a bit predictable, in a way that was one of the things that I liked about it. I could sit back and watch the fireworks. Sybil and Roderick are at loggerheads right from the moment they lay eyes on each other. They declare outright war as they wait for the judge's decision on who will inherit the house. Sybil is very quick witted and their little squabbles and snide comments provide much humour and entertainment as they progress from enemies to truce, friendship and love. I enjoyed the ghostly activities in the house. The haunting of the house was well written and it added an extra layer of mystery and atmosphere. The side characters were intriguing. Mrs Dove was a nasty piece of work and I couldn't wait to see how Sybil would deal with her. The night of the musicale stands out as one of my favourite scenes. I also listened to the audio version of the book, narrated by Elizabeth Klett. Once again she performs the story with elegance and ease. It is very easy to listen to and she adds something a little bit special to the story. Sybil's character in particular really comes to life. The narrator inflecting her tone of voice allows us to hear more clearly the sarcasm and barbs pointed at Roderick and Mrs Dove, that a reader might otherwise miss. 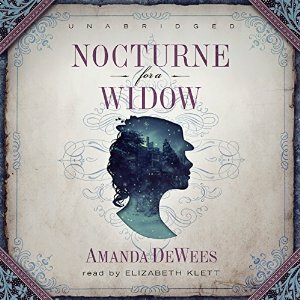 I purchased the Kindle copy of Nocturne for a Widow but I received the audiobook in exchange for an honest review.